Passing the National Registry of EMT (NREMT) or State EMT exam is the the biggest hurdle to becoming a certified EMT. 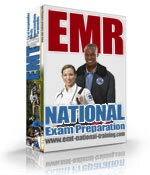 Proper exam preparation is the KEY to your success and EMT-National-Training.com is the leader in the EMS exam industry. Join the thousands of other successful EMTs and paramedics who passed the NREMT exam on the first attempt after using our product! Works on Mac and Windows. NO software to download! What Makes EMT National Training the Best Choice for NREMT and State EMT & Paramedic Test Preparation? Instant Access to over 3000 NREMT Style EMT Practice Questions, ANSWERS and Rationales. The internet is on 24/7. This allows you to take practice examinations whenever and where ever you want. 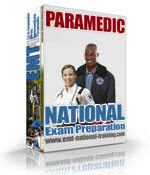 EMT National Training has the largest database of EMS questions, answers and rationale available. Using it will sharpen your knowledge to the point where success on the NREMT exam is guaranteed! All questions were written and validated by Certified Paramedic and EMT instructors following the current DOT EMT Curriculum utilized by the NREMT. This ensures that you are seeing questions that are accurate and closely related to the actual NREMT exam. *As the year progresses we will begin introducing new levels and scope of practice questions for the new National EMS Standards. These new standards have been adopted by many states already and as the NREMT begins testing for them we will make them available. "Got the results and I passed my test!! Just wanted to send you guys a big thank you for helping me study and be successful on my first try for the NREMT-B test! This website was a great help and I will recommend it to anyone I know who will be taking the test in the future. I will also be using it again in the future to get my paramedic certificate. We give you the opportunity to study in 3 different ways. Classic random tests deliver a standard EMT test with a mix of all the content areas covered in the EMT scope of practice. EMS Category tests let you focus on one specific category of question at a time ie. Airway Management only... or Trauma. The NREMT Simulation is as close as you can get to the real thing. Our proprietary application delivers the same percentages of questions per category as the real NREMT exam. Questions are delivered one at a time and a timer keeps the pressure on while you wonder when the exam will stop! Anytime that you want to create a new examination you just click a button and the exam instantly appears in your web browser. At the completion of the exam click the"Grade" button and your exam is instantly graded and your results delivered. If you answer a question incorrectly we will tell you not only the correct answer, but WHY the answer was correct. We don't send you to the page number of some book... we just explain it. 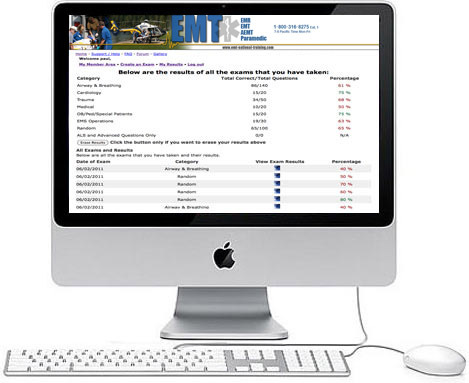 The exam tracking and review features are probably the most valuable component of EMT National Training. Every exam you take is logged into your results page where they can be reviewed at any time. Results for NREMT Simulations tell you exactly how well you did in each of the category areas. Detailed cumulative scoring and test tracking allow you to watch your progress the entire way as you better your weak areas and fine tune the areas that you are already strong in. We are constantly adding to and refining our database of questions. Although few customers ever see everything in our database...we have six EMS authors to keep things fresh. There are no limits on the number of examinations that you are permitted to take. Each exam is filled with questions that you have either never seen, or questions that you have answered incorrectly. This continues until all questions in a category have been answered correctly and then they too are re-included in the question pool. What if I Have Questions?...or Need Help Understanding Something About EMS or the NREMT? We have an excellent staff and each person is dedicated to helping you pass your NREMT or state EMT examination. If you have questions about an answer in our database or maybe want to know more about the EMT certification process in a particular US state we are here to help. Live chat and toll free phone support are available during normal business hours. Email and Online Helpdesk support is available 24 hours a day and is often answered outside of business hours. Certified Paramedic and EMT Instructors Respond to All Your EMS questions. If you have an EMS question about a procedure or intervention it will be answered by an instructor with years of knowledge and experience in EMS. EMT National Training is in the business of helping people gain NREMT certification and state licensure as EMTs. Through-out this endeavour we have amassed a wealth of information that is not readily available to the public. None of the things we know are secrets, but they can be very difficult to track down. We are available to answer any question related to the NREMT which you cannot already find an answer for on our website. EMT National Training was created by EMT & Fire Training Inc. an internationally recognized EMS training institution registered with the Idaho Department of Education and Accredited by the Continuing Education Board for Emergency Medical Services. "Thought I would pass on my appreciation for the quality of your site. Passed the NREMT first time. The test was hard but I went in with confidence and knowledge. The NREMT simulation looked just like the testing site. You actually saved me money in not having to retake it." Maybe We Should Call it the 200% Guarantee? If you do not pass your NREMT or state EMT examination we will extend your subscription FOR FREE until you do pass. That is worth at least 100% of a subscription price. 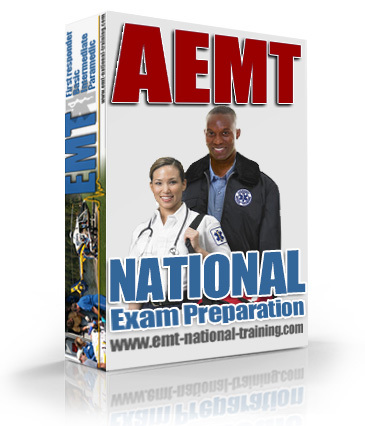 If you use EMT National Training as recommended and still fail your NREMT or state EMT examination we will refund 100% of your subscription.